The daily life and duties of a Cistercian monk at Tintern Abbey in the 14th Century. 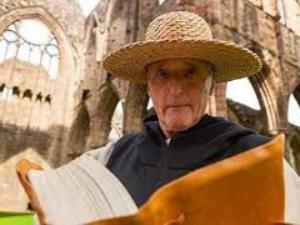 Brother Thomas will tell you all about his life as a monk at Tintern Abbey. Our sympathetic and helpful brother will give you inside information about the monks’ rituals and responsibilities. As the cellarer of Tintern Abbey, he will be able to tell you all that is to know (and perhaps some things you shouldn’t know!) about the workings of the abbey, his fellow monks, the lay brothers and other ‘less religious’ people! You will learn about the daily life of the monks at the abbey, including their monastic duties, hygiene and eating habits, as well as the numerous religious services they would have to attend throughout the day. Brother Thomas will be available from 10am until 4pm, and will give tours at 11am and 3pm, and a presentation in the Outer Parlour at 1pm. Tours at 11:00 & 13:00.